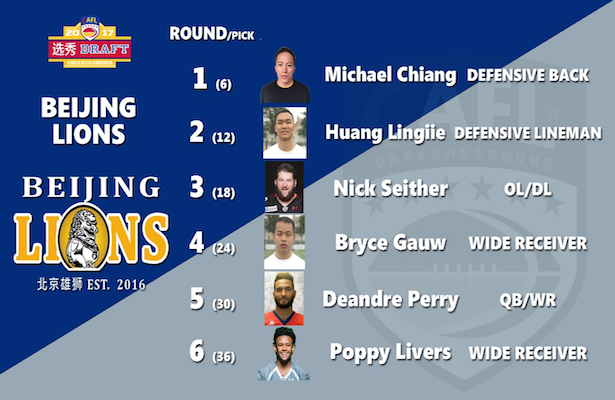 It might be hard to find a Chinese defensive back from Vancouver, BC, but Lions coach Clint Dolezel did just that. Chiang checks in at 5-8, 170 and played college ball at Simon Fraser University. Huang, who stands in at 6-3, made his mark at the Shanghai combine. He will try to fit into the spots left by Louis Nzegwu, who was released and Paul Cheng who retired at the end of the season. Seither fits the Dolezel mold as he plays in second season in the AFL with Cleveland. At 6-3, 270 he has the size and skill to be a force on either side of the line. In 2015 he attended rookie camp with the Arizona Cardinals in the NFL. Seither makes his home in Hamilton, Ohio. Guaw took part in the Shanghai combine and showed the skills that make him a candidate to replace Junxing Zhang who was released at the end of the year. He becomes the second Chinese player from Canada to join the roster as he resides in Edmonton, Alberta. Perry has can be a “big” receiver in the Beijing offense as he stand 6-4, 225. Growing up in Austin, TX, he attended the University of Houston and Oklahoma Panhandle State University. Perry has professional experience playing for the Amarillo Venom of the Champions Indoor Football league. A small, agile receiver at 5-7, 170, Livers currently plays for coach Dolezel with the Philadelphia Soul. He also played professionally in Germany with the Cologne Crocodiles and was a standout at Villanova University.